Today in San Diego we were treated to a partial solar eclipse. However, since at its maximum the moon only covered 45 % of the sun’s surface, most people were unaware that an eclipse was happening. How amazing is that, that 45% of the sun’s rays onto the Earth are blocked by the moon, and we don’t notice? Our sun is AWESOME! Here is a link to an amazing video of the eclipse taken by the Griffith Observatory in LA, it condenses 2 1/2 hours of the eclipse into one minute. This is my attempt to document the eclipse. 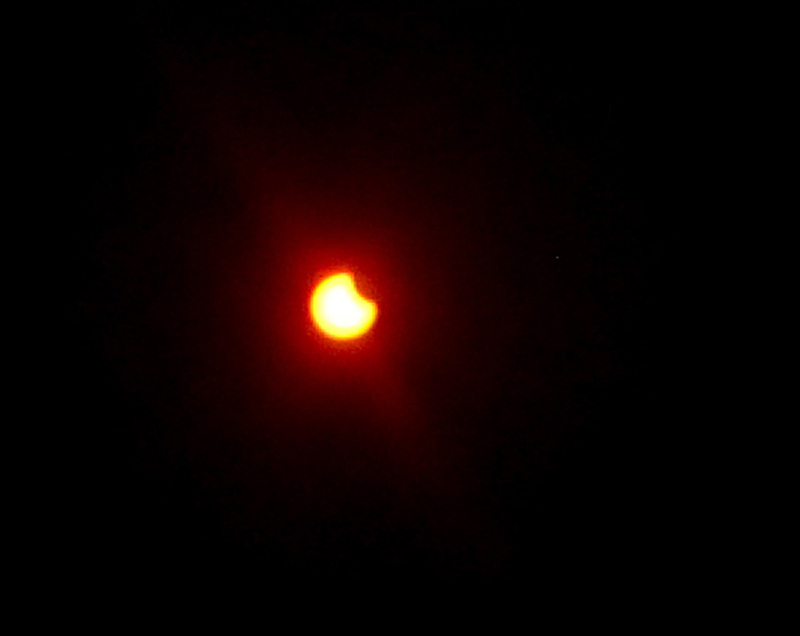 I put my eclipse viewing glasses over the lens of my point and shoot camera and snapped a picture. You can’t see them on my picture, but on the Griffith Observatory picture you can see a big patch of sun spots. When I looked with the naked eye I could see what looked like one big sun spot, not the collection of 3 or 4 you can see on their photo. 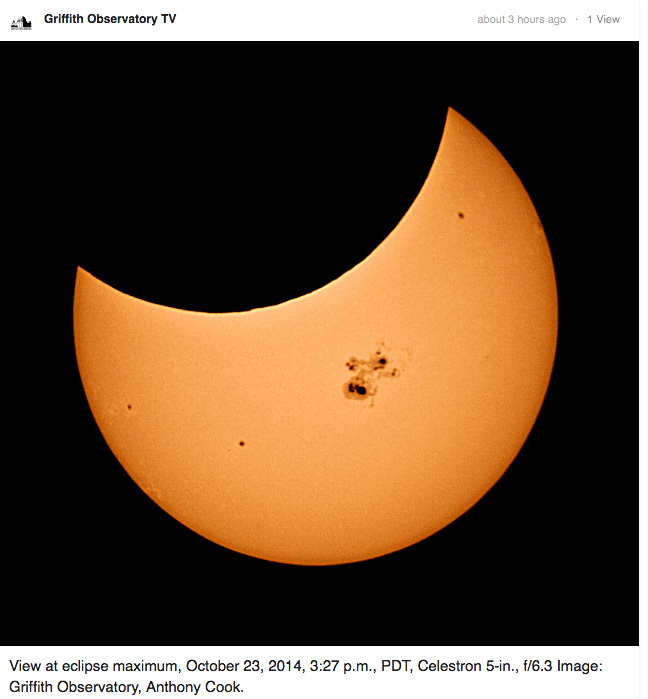 Here is the view of the eclipse at maximum, again from the observatory. There are other ways to view an eclipse. 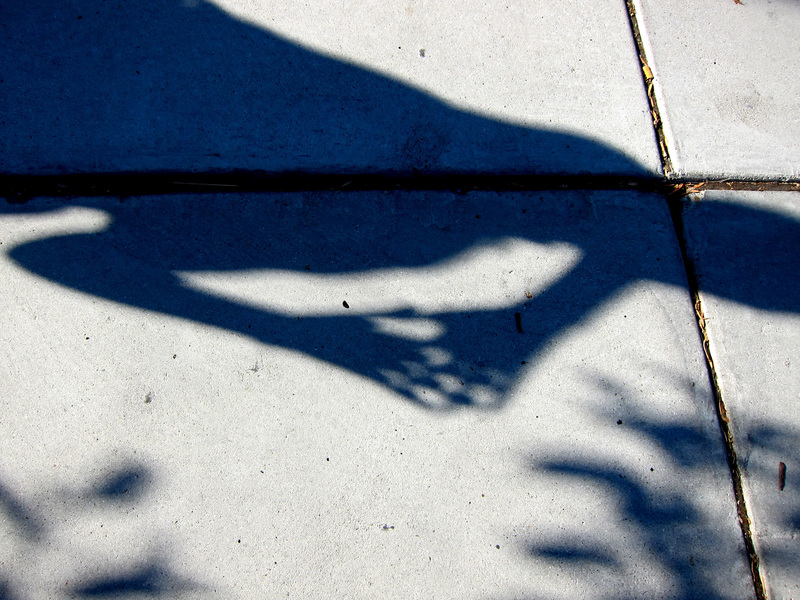 You can make a pinhole camera by poking a hole in a board and holding it up to the sun, and then you can look at the image it projects onto a surface. Or you can get a super fancy version of that, like they had today at the Reuben H. Fleet Science Center in San Diego. 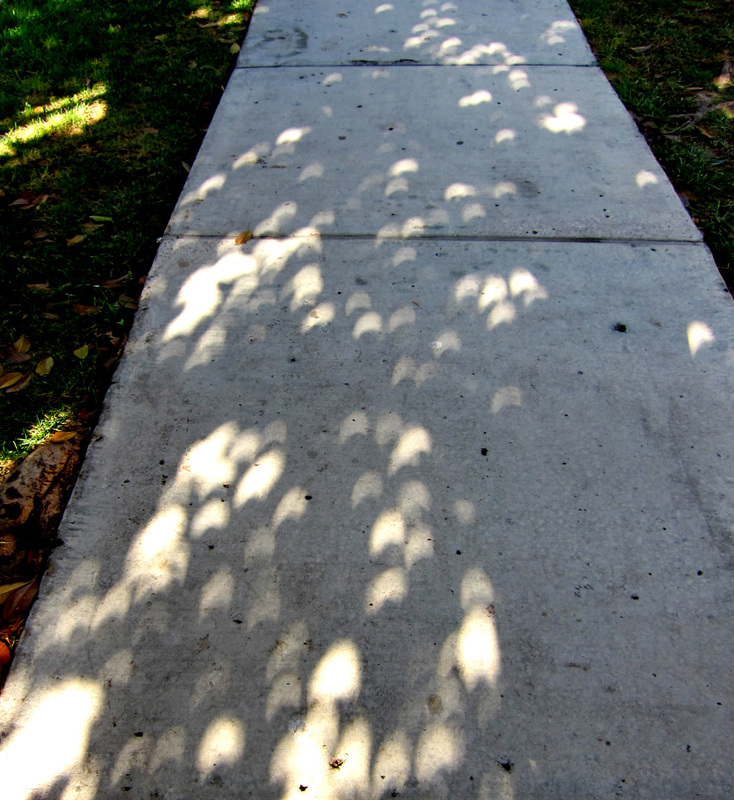 You can get the same effect by looking at sunlight filtered through tree leaves onto a sidewalk. I took this picture this afternoon during the eclipse. See all the little crescents? Or, as my son Sam showed me after I picked him up from school, you can create the same effect by interlacing your fingers. 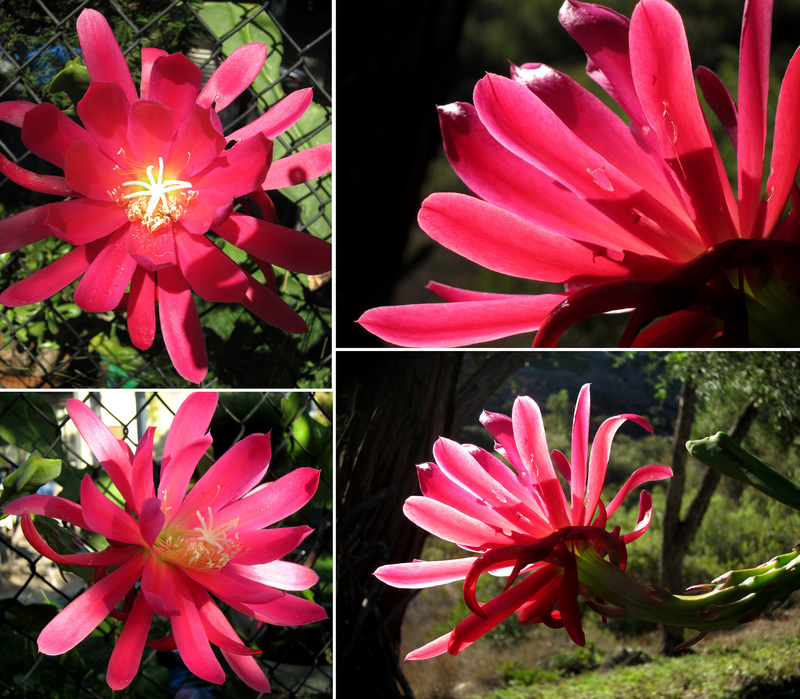 This morning, before the eclipse occurred, I noticed the morning sun shining through the petals of a newly blossomed cactus orchid in my yard. It is a good thing to be in the celestial Goldilocks zone! Life on Earth is so beautiful. And finally, a picture Sam took recently. 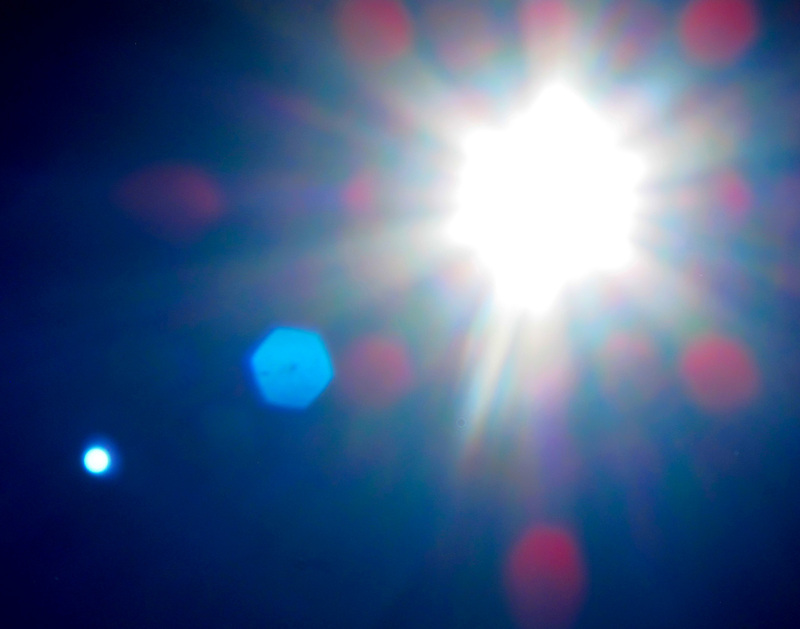 He pointed the camera directly at the sun. If you listen carefully, you can hear the image sensors in the camera screaming. If you aren’t already familiar with the Khan Academy, it is a free educational website which provides tutorials and practice problems in subjects such as mathematics, history, the sciences, economics, and computer programming. It was founded by Sal Khan, who has baked a four tier advanced degree cake for himself (BS’s in math, electrical engineering, and computer science, and a masters in electrical engineering from MIT), frosted with a MBA from Harvard. He has a real knack for teaching using discrete steps and examples in video microlectures, which he illustrates with a digital chalkboard and multicolored pens. He has a very calm and mellifluous (now THAT’S a SAT word) voice, which comes in handy when a kid gets stressed out during a lesson! The mathematics starts at 1+1=2, and go all the way up to advanced algebra, calculus, and geometry. The other subjects tend to be mainly aimed at upper middle school, high school, and college students. The purpose of this post is to get you started on using Khan Academy to supplement your child’s education, or if you are a teacher, to use it as a classroom resource. The main focus will be on using Khan Academy to work on Common Core math standards for students in primary and secondary school. 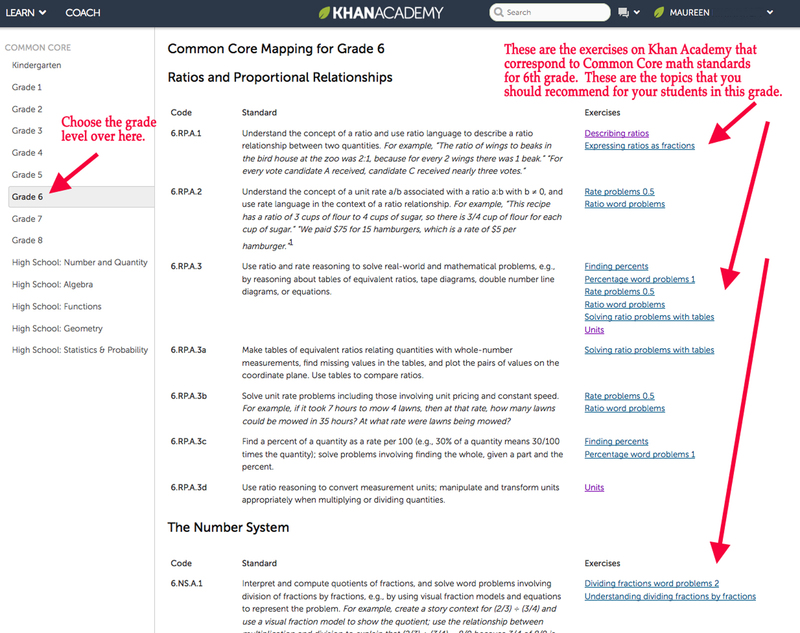 Khan Academy has added new resources which make it easy for you as a parent or teacher to tie the work that a student does on the site to the Common Core math standards at his or her grade level. This is a HUGE improvement in my opinion, as I always found it difficult to figure out what to have my children work on, and would come back sometimes to find them very frustrated, as they were working on concepts too far above their level. This is no longer an issue, along with them working on subjects that were too easy. Like Goldilocks, it is now easy peasy to get your math porridge JUST RIGHT! This is a long post, with lots of screen grabs to illustrate the points I will be discussing. If you click on any of the pictures, they will be magnified, which will make it easier to see the details. I hope you find it helpful in utilizing this incredible (and did I mention FREE) resource to enhance your child’s learning. I think parents and teachers will find that is great for tailoring lessons to children who are proficient, advanced, or struggling in math. If you get tired halfway through reading it, get up, stretch, get some coffee and some of your kids’ Halloween candy, then head on back to learn all about it! 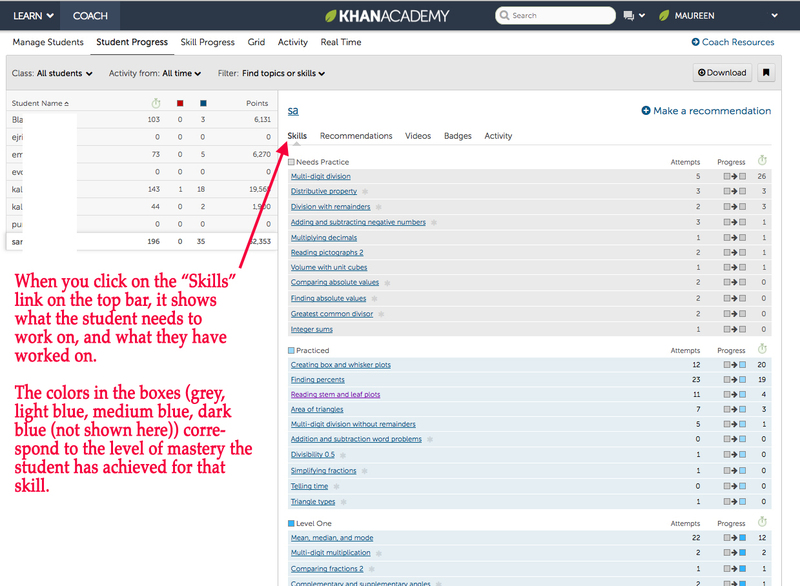 ***Since I published this post Khan Academy has changed their dashboard a little bit, for the better I think. Now you can go to “Learn” and under “Math” will find topics with videos and problem sets arranged by grade level. Much easier to use! My post does help with setting yourself up as a tutor, but there isn’t as much of a need to assign topics to students, as they are nicely packaged by grade now! The first step is to create a Khan Academy account for yourself. The web address is http://www.khanacademy.org. Once you have an account you can log in directly through Khan Academy (which is what I do), or through Google or Facebook. You need your own account, because this allows you to act as a coach for your children or students (as their coach you can direct them to content you would like them to work on). Adults who log in are offered the option on the upper left of their home page to “Learn” or to “Coach”, kids/students only have the “Learn” option on their home page. Here is a screen shot of my home page, notice the red arrow. When you see my son’s homepage later, there will be no “Coach” section. Even as an adult, you will be prompted to take the math pretest the first time you log in, as will your students. This is very short, less than 10 questions, and is designed to figure out what you already know so those topics can be added to the list of ones you have mastered. I mostly did it just to stop the prompts to take it. You will also see a tally of points and badges you have earned (you get points just for joining and doing the pretest). I am not setting a very good example, I only have 2,500! More on points and badges later, I will quickly tell you that they are used as a reward system. Also notice the Mission Progress grid with the colored grey and blue squares to the right on my home page. This keeps track of you or your student’s progress in mastering all 548 topics in the World of Math. Grey indicates no practice, lighter blue some practice, and dark blue mastery. Remember that “Coach” tab on the upper left of my home page? That’s where we are headed next, to set up student accounts. If you click on that button you will see this page appear. If you don’t see this window, make sure you are under the “Manage Students” section on the far left of the top menu bar. This is where you can create student accounts for the children you will coach or teach. One way to add students is to click on the big green “Add new students” button. When you do this you will be prompted to email students, so they can sign up with you as their coach. This might be more useful for teachers. I didn’t set up my accounts this way. I created all of my student accounts under the “Students” tab on the far left. If you click “Child accounts” you will be prompted to set up a new account. You will need the child’s name, birthday, a user name (don’t use their full real name as their user name), and a password. To make everything really simple for my kids and their friends that I set up accounts for, I made all their passwords identical. That way no can ever say they can’t remember their password. When dealing with crafty children, you must learn to be wily like a coyote! Though in a classroom setting this might not be practical. After you set up accounts, you can put the kids into classes, which I did with my set of middle schoolers. One last bit of info on this page. The “Settings” link is where you can change user names or passwords, should the need arise. After you have created accounts, it is time to pile on the work! If you click on “Student Progress” on the upper menu bar it will take you to this page, which lists all the students that you have signed up to coach. My son Sam is the last on the list, I will use him as my example. Now for a quick stroll through Sam’s account, to show you how to use the links to keep track of what work a student is doing and what recommendations you have made for him or her. I will go over how to make recommendations next. The page below is what you see when you click the “Skills” link. This page shows the list of all the recommendations that you have made to a student. And this page shows the activity on the site for your student. Now I’m sure you have noticed all of the wonderful recommendations Sam has, and are maybe even feeling a little jealous. How can I get a beautiful list like that for MY students. Well, since you asked…back to the page that lists my students! Remember, you get here from your homepage by hitting the “Coach” button. On the upper right is a very useful link called “Coach Resources”. 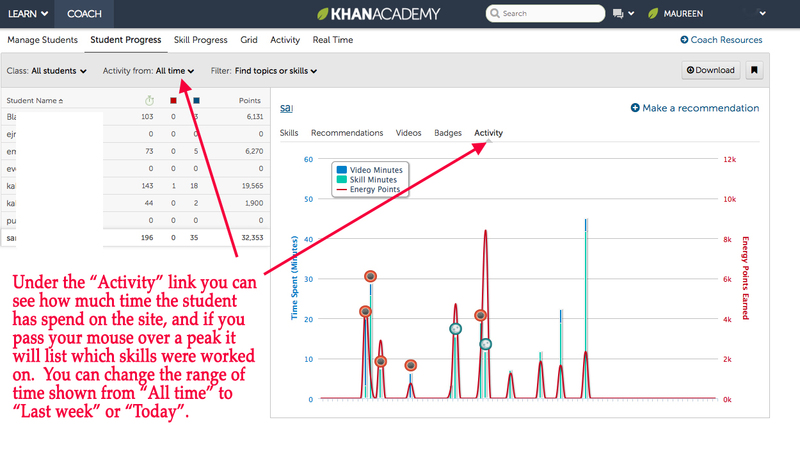 If you head into this portion of the website, you will find lots of information on supporting students using Khan Academy, including videos explaining how to coach! You can get the scoop from the real experts here. 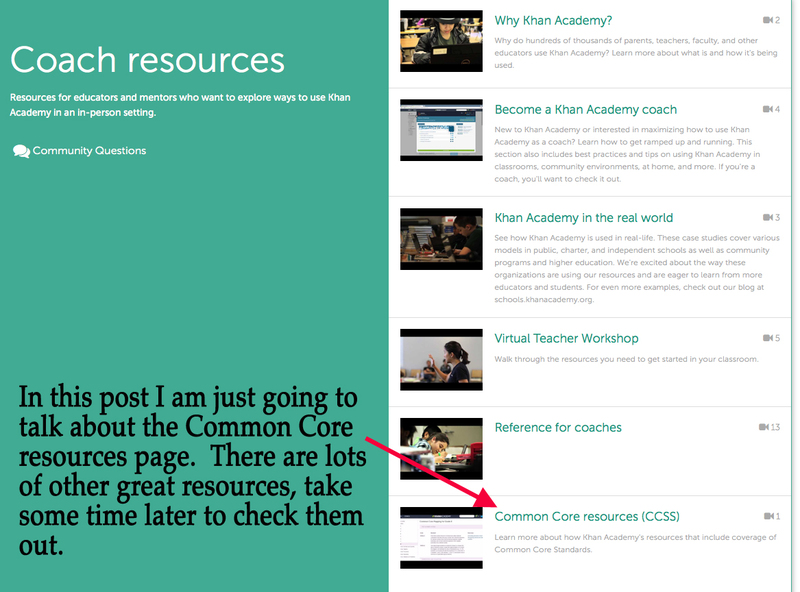 In this post I am just going to focus on the Common Core resources link. This link takes you to the page below. Click on Common Core map next. Which will take you to this page. Click on this purple link to get to the map page. 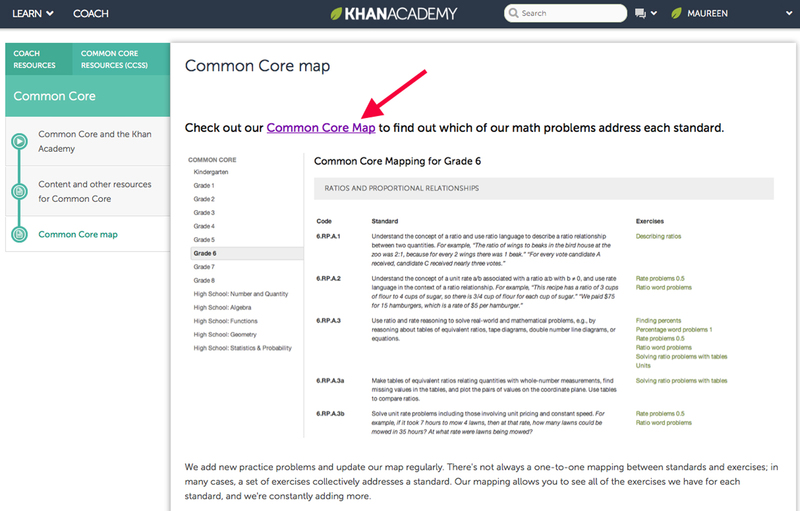 The address for the page is https://www.khanacademy.org/commoncore/map, if you want to bookmark it. So here we are, at the Common Core map. This is a VERY USEFUL page! On the left is a menu where you can select the grade level. After you do, a list of the Common Core standards, along with the topics/exercises on Khan Academy that correspond to those standards appears. I used the application Preview to take screen grabs of this list, which was helpful when I entered the recommendations into the students’ accounts. Some topics cover more than one standard, so you may see a topic listed two or even three times. So copy and paste, do a screen grab, write them down, or if you are a memorization champion, just stare at them for a minute. We are going to need this information to proceed. We are heading back to “Coach”, then “Student Progress”, then we are going to select Sam’s account, and we should see this page again. 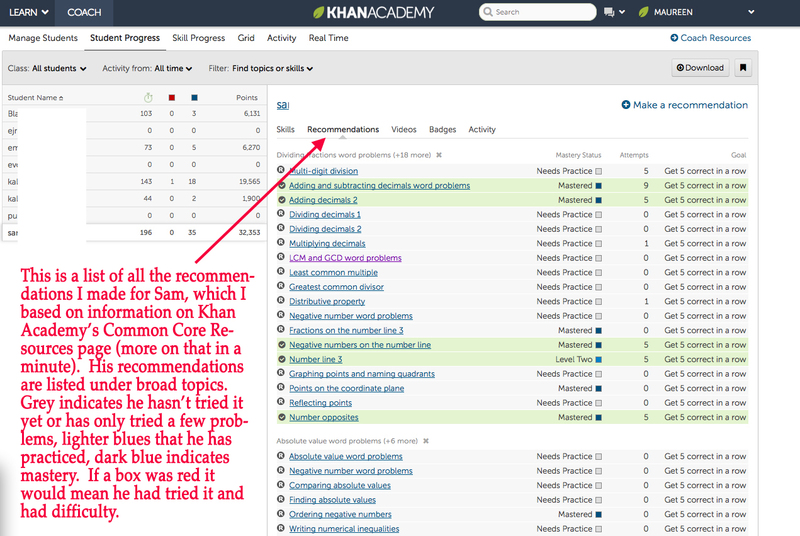 Click on the blue “Make a recommendation”link, which leads to an searchable list of Khan Academy topics. This is where you will use the list we got from the Common Core standards page to find the topics you want recommend to your student. The “Make a recommendation” tab is also available under any of the top menu tabs (Skills, Videos, etc). When you get to the recommendations page, type in the first few letters of a topic, like “mea..” for “measuring angles”, into the search box. 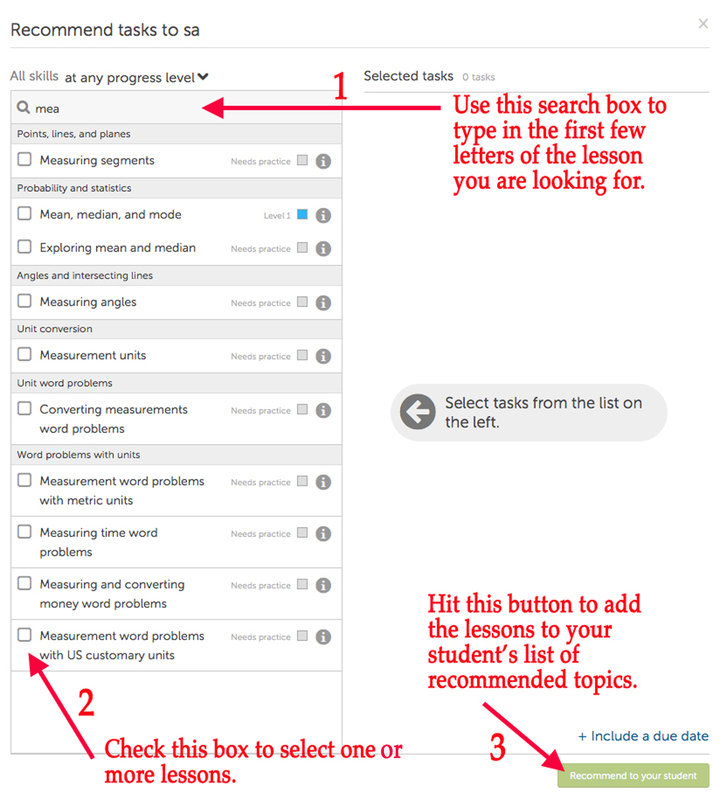 You will see an alphabetical list of topics pop up that start with those letters (this is why it is important to have the grade level list to work from, so you know what to type in to find a particular lesson). Click on the box of the topic or topics from the list you would like to recommend, and then hit the green “Recommend to your student” button on the lower right. You did it! You have recommended a lesson. Keep going, add a few at a time, or throw in the whole list like I did. If the kid complains, pull out a hardship story from your childhood. Here’s mine that I use on my kids (true story, BTW). “When I was in middle school in Wisconsin, I had to walk over a mile to get there. One day in January I forgot my hat. Walking home that afternoon I got frostbite in both of my ears.” Makes having a list of 30 or so topics in Khan Academy seem like small potatoes. 4. How students use Khan Academy. So now that the accounts are all set up, and the recommendations made, let’s get down to the nitty gritty of kids learning stuff. The first time a child logs in they will be prompted to take a very short pretest, which will cause some topic boxes in their Math Mission Progress grid to be colored in (the grid is on right hand side of Sam’s homepage). As your student practices topics and masters them, the boxes on this grid will go from grey, to light blue, to dark blue. The student’s homepage will display the recommendations you have made, and even before you make any Khan Academy will put in recommendations based on the results of your student’s pretest. You can also see what topics were recently done, how many points and badges have been earned (still not ready to tell you exactly what these are), and also whether a mastery challenge is available. Mastery challenges are mixed reviews of topics students have already practiced. After a topic is practiced in a mastery challenge, the square for that topic turns darker blue, and after it is mastered it is dark blue. So what happens when a child clicks on a recommended topic? Glad you asked. 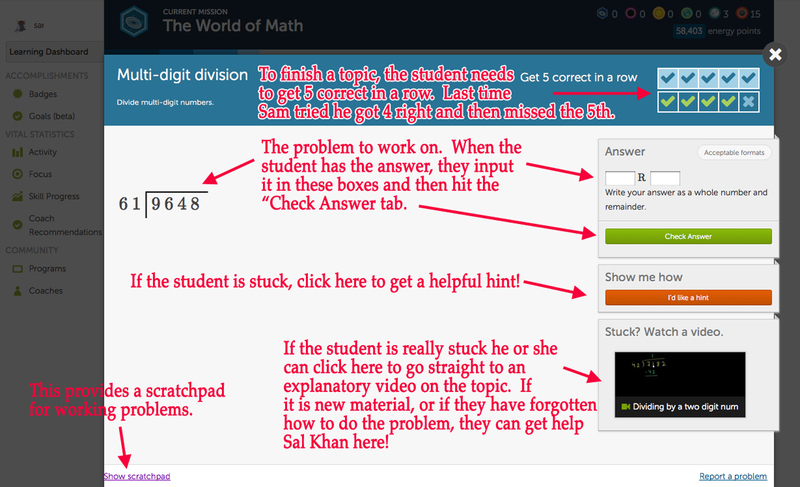 Below is the problems page for Multi-digit division. A practice problem shows up on the left, the answer input box is on the right. If a student gets stuck, there are two options. One is to ask for a hint, the second is to go to the video tutorial on the topic, where the problem is explained and demonstrated. To go on to the next topic, a student needs to get 5 in a row correct, also know as “Five and Alive”! It makes kids howl when they get 4 in a row and then miss, like Sam did below, because then they have to start over. Clicking the “Check Answer” box on number five is always nerve racking. 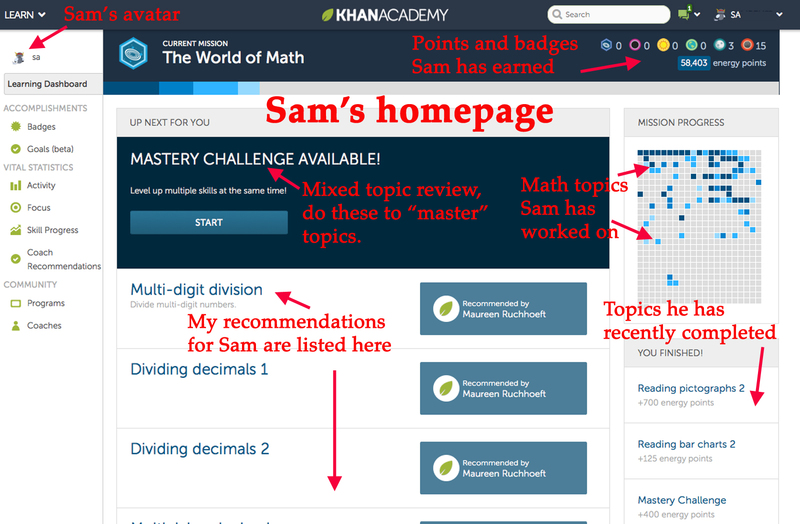 When Sam sits down to do Khan Academy, I usually ask him to do a mastery challenge and two to three new topics. He can sometimes finish a topic in 5 minutes, sometimes it takes him 20. What makes him interested in doing math on the site? A few things. One is that it is on the computer, because, like most kids he loves electronics. There are also rewards built into the site. One is energy points. Students earn them by watching videos and doing problems. As you accumulate points, you can use them to change your avatar on the site. The generic leaf avatar is the one that everyone starts with. You can change the color, but to get one of the other cool avatars you need an increasing number of points. You get to the avatar choice window from your homepage. Click on your name and beginning leaf avatar on the upper left, then click on the leaf, and the page below will appear. 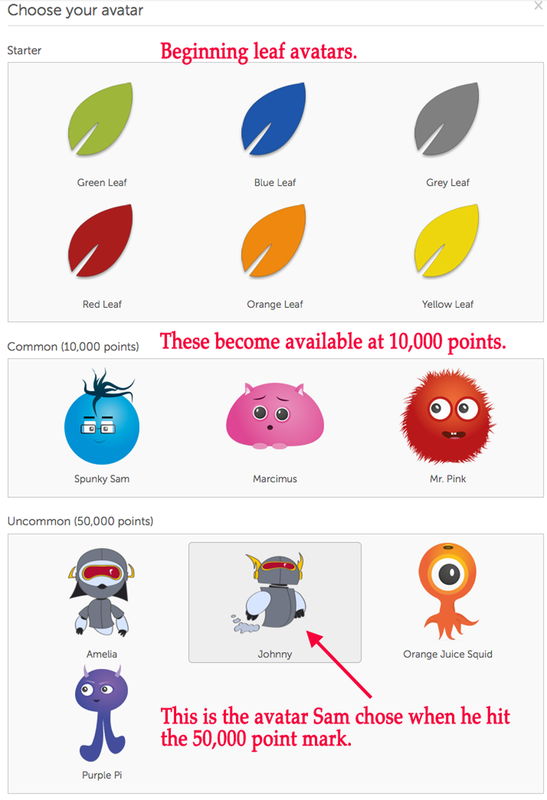 At the beginning only the leaf avatars can be chosen; Sam has all three levels to choose from because he has over 50,000 points. 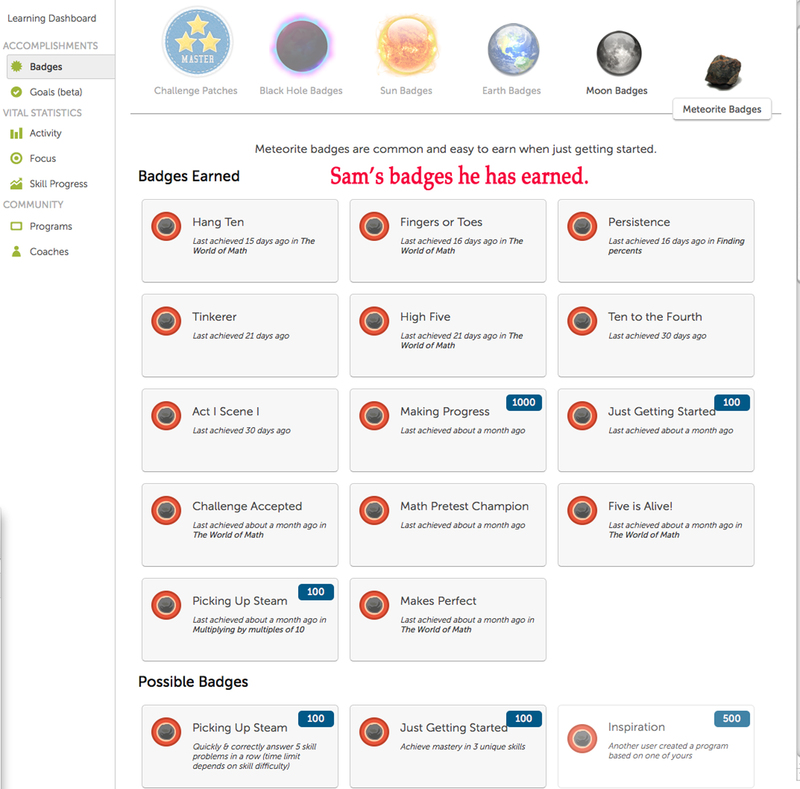 The other reward system is made up of badges, the listing for them can be accessed on the upper right of the homepage. Students earn various badges for working on the site. Sam’s meteorite badges are show below. 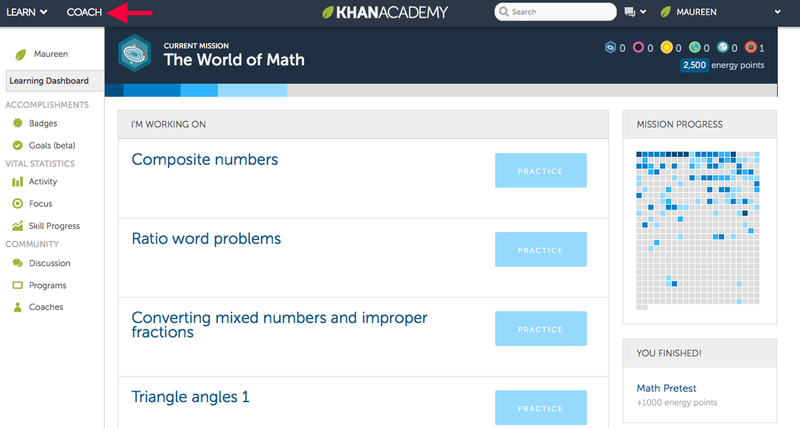 Finally, there is much more to the Khan Academy site than just math. My son loves the computer programming tutorial, and has spent a lot of time plugging away at that. All the other topics are found under the “Learn” tab on the upper left. I know it is hard to believe, but I think this never ending post has finally come to an end. It has taken so long to get through that your children are probably adults by now, but you can always use all the wonderful knowledge you have gained here to tutor your grandchildren. Images in header taken from khanacademy.org, digitwhiz.com, corecommonstandards.com, http://www.zazzle.com (breadpig). You can order your own “Yes We Khan” poster seen in the post header from zazzle! “Emma, it’s time to MOOC”. “We’ve got to MOOC it MOOC it, we’ve got to MOOC it MOOC it”. If you are a fan of the Madagascar movies, you know what I am talking about. I recently created accounts on four different MOOC sites; Coursera, edX, Udacity, and Open2Study. What brought this about was a missed opportunity when I was in college at Wellesley. I was a science major (Biology) and I had to take math, chemistry, and physics courses to fulfill requirements, which left me little space for humanities classes in my schedule. Wellesley, at the time (late 1980’s), had an amazing Art History introductory course, which was supposed to be very difficult and time consuming (the final was legendary), but a great experience. I never took it, to my eternal regret. So on an impulse one day I checked to see whether Wellesley had an Art History MOOC. They did not. I guess this is still reserved for paying customers. But it got me looking around at the world of MOOCS, signing up for various sites, and enrolling in courses. I was not looking for what I wanted to take per se, but what might be of interest to my 13 year old daughter, who has high functioning autism. Emma is 13, as smart as they come, with a high interest in science (cosmology and biology have been favorites for years). She also can be difficult to shepherd through life, and the expectations of life both at home and at school sometimes challenge her. I lit upon the idea of MOOCs as a way to help develop her executive function skills (time management, organization, attention) while working on material in areas of her (sometimes obsessive) interests. That was the original idea, but it has gone so much beyond that. I may need an intervention soon. Over the summer Emma and I finished two MOOCs (Introduction to the Universe and Epigenetic Control of Gene Expression). This fall she and I will do From the Big Bang to Dark Energy (she loves cosmology!) and Human Evolution (offered by Wellesley, yeah! ), Sam and I will do Preparation for Introductory Biology and Beginning Game Programming, and I will be doing Networked Life (my friend Mike is teaching this one) and A History of the World from 1300. It sounds like a lot (and probably is a lot), but the beauty of MOOCs is that they are FREE, and you can put in as much effort as suits you. Sam’s Biology MOOC is a great example. They have a basics track (you watch videos and take quizzes) and a scholar’s track (you do other assignments as well). I am doing the basics track with him, and it is perfect. It also helps that the material is quite familiar to me, so I pause the videos to make sure he is following or to explain the material further, or I review the material with him afterwards. 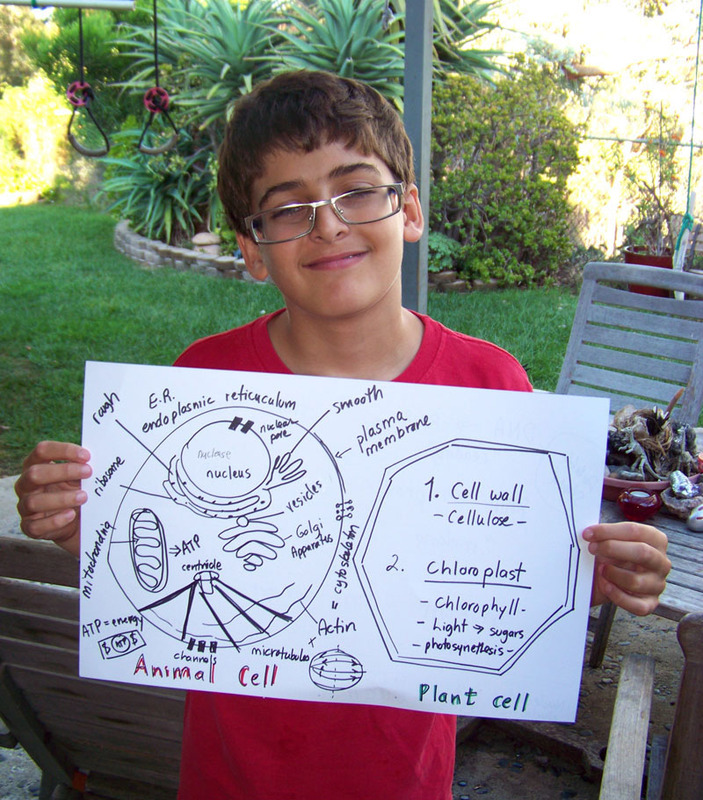 But as an 11 year old he is getting a great introduction to basic concepts in biology and biochemistry such as DNA replication, the structure of the plasma membrane, and protein synthesis. He may not remember most of the details, but when he hits the material in high school it won’t be the first time he has seen it. As I said, it helps to be familiar with the material if you are using these online classes to supplement your child’s education. Sam’s upcoming MOOC, Beginning Game Programming, should be interesting, as I know nothing about computer programming. Trying to take it may be full of fail, but again, it doesn’t matter. We will just chalk it up to an error in judgement, and move on. I sometimes have the opposite problem with Emma, as she got very bored with the introductory lecture for her cosmology MOOC, and started lecturing back at the screen. Good practice though, since it was a chance to work on what is okay to do when you are bored in class. Shouting back at the professor…not so good. The MOOCS have been great for both kids in driving home the lesson that you need to keep up with your work, as the weekly quizzes close out after the due date, and you need to have watched all the weekly videos (usually 4 to 6) before then to pass the quiz. It is a shift from the type of responsibility expected from students in middle and high school, where the progression of learning is mapped out by their teacher. This puts the onus on the student to fit their work into their schedule and to budget their time, which is more reflective of what they will experience in college. But the great thing about MOOCs is that you can access college level curriculum without the pressure of college. If you lose interest or run out of time and can’t continue with a MOOC, you just quietly slink out of the back of the virtual classroom and no one is the wiser. But if you are really gung ho, you can pay a fee (usually around $40) and get an official certificate of completion for the course. I’m not sure how this will translate into real world credit; this is one of the aspects of MOOCs that is still evolving. One final general observation about MOOCs is that the level of the material covered and the difficulty of the quizzes and assignments varies a lot, depending on the target audience. Some are taught at a very high level with a lot of detail (the Epigenetics MOOC we took), versus others that are more about providing a general overview of a topic (Introduction to the Universe was more along this line). Both types of courses have their purpose, and it would be good to understand which kind of MOOC you are signing up for, particularly if you are planning to take it along with a child. There is a MOOC on just about anything. Offered by colleges and universities all over the world. We got to listen to Dr. Marnie Blewitt’s awesome Australian accent as she lectured to us about DNA methylation and nuclear compartmentalization. My class on networks is being offered by the University of Pennsylvania. Don’t be intimidated, just get online and sign up. The learning is easy! 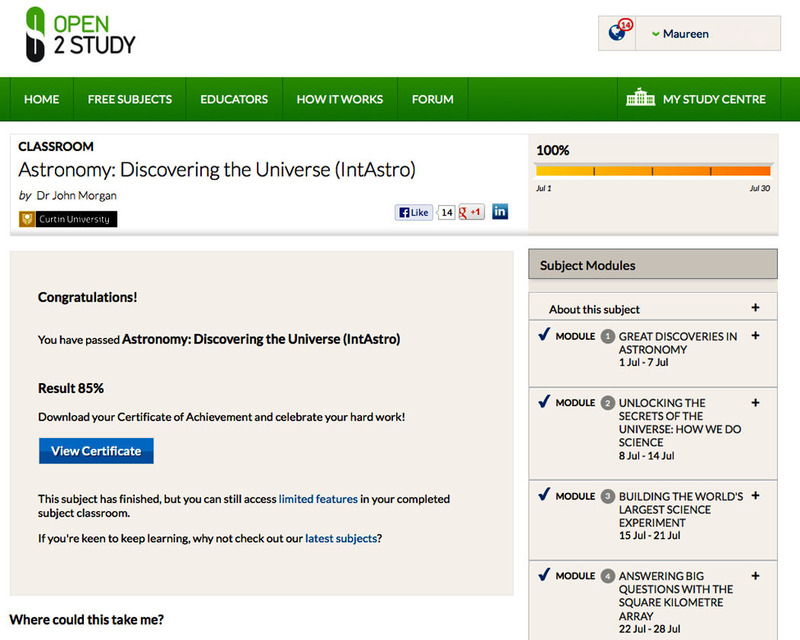 The completion certificate Emma and I earned for Astronomy, our first MOOC.